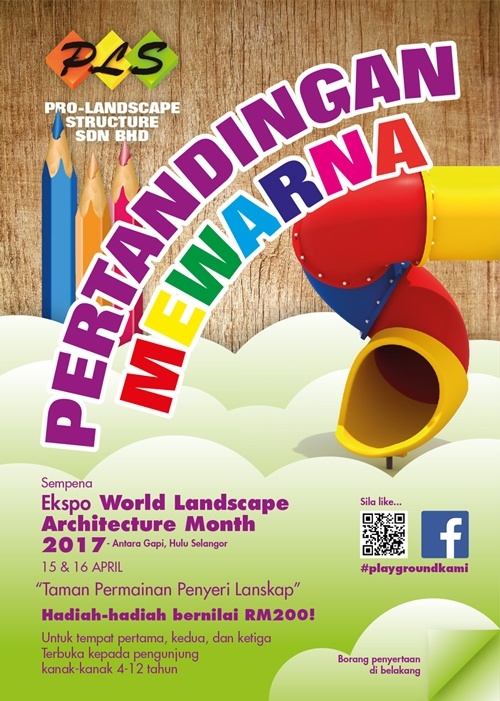 We invite you to join us at the World Landscape Architecture Month 2017 Expo on this coming 15th and 16th April. This international yearly event is held to bring recognition towards landscape architecture, to give opportunities to local landscape products and services players to promote their businesses. As our nature of business involves both softscape and hardscape, we felt the need to be a part of this major event, and we would glad to have your support too by joining us. The event will start at 8am on the 15th, and ends before 12am on the 16th. Among the activities will be landscape planning competition for schoolkids, colouring contest, futsal tournament, karaoke, display of landscape products, famous artists' performances and our very own colouring contest at our booth. Prizes worth RM200 up for grab for your kids.